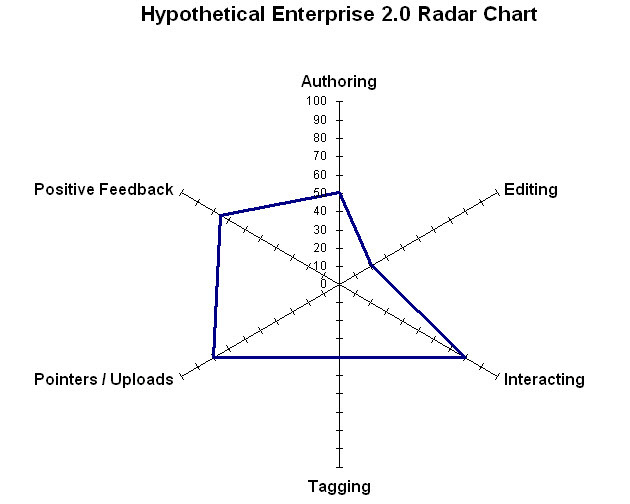 The Enterprise 2.0 sector draws heavy inspiration from innovations in the Web 2.0 world. Indeed, the name itself, Enterprise “2.0” reflects this influence. From a product management perspective, Web 2.0, and its derivations social networking and social media are great proving grounds for features before coding them into your application. A fruitful area to review is how long it takes for a feature to go from some level of decent adoption in the consumer realm to becoming part of the mainstream Enterprise 2.0 vendor landscape. The list of features that have made the jump – forums, wikis, blogs, tagging, social networking, activity streams, status updates – is impressive. Let’s look at three features that made the leap, with an eye toward how long it took. Here’s the back-up for those dates. Wikis: Wikis got their start back in 1995. From there they grew, and the application became popular with computer programmers. But it hadn’t caught hold outside that culture. Wikipedia was launched in January 2001, and grew rapidly over its first two years. It wasn’t yet mainstream, but it clearly had caught a wave among early adopters. As recounted on the history of wikis page in Wikipedia, 2004 – 2006 saw an explosion of interest in wikis from companies. Social networking: Defined as enabling social profiles, and connecting with others. Facebook started in 2004, and grew very popular among colleges. In 2006, it opened up its membership beyond college students, and turned down a $1 billion offer from Yahoo! Clearly, the company was on fire (even then). In April 2008, Jive released Clearspace 2.0, which was touted as Facebook for the enterprise. Socialtext 3.0 was released in September 2008, and it included Socialtext People, its social networking feature. And I can tell you that at BEA Systems, there was a second quarter 2008 release of a Facebook for the enterprise in the Aqualogic product line. Microblogging: Twitter. The source of it all. Twitter actually was conceived as an idea back in 2000, and company was started from a 2006 brainstorming session at Odeo. But it really hit big with the early adopter set at 2007’s South by Southwest. Microblogging broke into the Enterprise 2.0 world when Yammer won best-of-show at the September 2008 TechCrunch 50. But that doesn’t count as mainstreaming into Enterprise 2.0. Yammer proceeded to grow strongly the next few months. And Socialtext introduced Signals in March 2009. So there’s some documentation backing my 2-year cycle for Web 2.0 innovations to move from hitting the early adopter set to the Enterprise 2.0 sector. Note that this doesn’t apply to every Web 2.0 innovation. No one ever talked about “MySpace for the Enterprise” and there’s really not a Flickr in the Enterprise 2.0 umbrella. Foursquare, and its up-n-coming competitor Gowalla, are all the rage these days. These location-based social networks are good for seeing what friends are doing. Foursquare also integrates features that reward participation (points), add a sense of competition (mayors) and provide recognition (badges). Mark Fidelman recently wrote about Foursquare and Enterprise 2.0. And using our handy two-year lag calculation, somewhere in early 2012 the first mainstream Enterprise 2.0 will integrate Foursquare features. Actually, two of them. Employees will check in their locations from all around the globe. Sales meetings, customer on-site deployments, sourcing trips, conferences, etc. Sure, this info might be in the Outlook Calendar. But even if it is, Outlook Calendar entries aren’t social objects. These check-ins will allow you to know where colleagues are, including those you don’t know well. But wouldn’t it be nice to know if some other employee visited someplace you’re investigating? These check-ins can be even more tactical. Folks who are part of a meeting in a conference room all check-in. Voila! Meeting attendance, which everyone can see. For an individual employee, these check-ins become a personal history of what you did over the past week. Foursquare makes it fun, and for many people, addicting, to check-in. You get points and *bonuses* when you check into the places you go. If you check in to the same place enough times, you get to be mayor of a venue and tweet it about it. 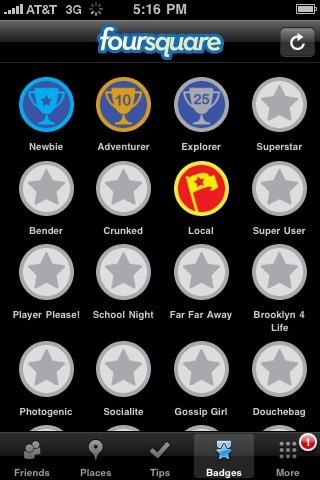 You earn badges for accomplishing different things in the Foursquare system. These features have had the effect of motivating legions of people to participate. It’s fun to see your stats. It’s fun to get a little competitive. It’s great when you get that notification that you’ve earned a new badge. Well, the Foursquare approach certainly takes us down this path, albeit in a fun way. I’d be remiss if I didn’t call out that Spigit already has these tools in place (ahead of its time?). So what do you think? Personally, I’m looking forward to more Foursquare in the enterprise. Extrapolating this then, that should also lead to more enterprise applications that seek to draw employees into collaborating and participating in different kinds of activities using the game meme. New tools are a challenge. I’m amazed at how many businesses still run off of email and office-type file attachments. You left out instant messaging above, how many companies have a fully deployed, secure, integrated internal chat system? The 2.0 world is great. It’s remarkably rewarding working with customers on solutions that provide them more collaborative and open ways of working then what they have today. However, while those of us that live and breathe the latest tools accept these into our daily lives, it is difficult for some enterprise employees to do so. In order for the latest thing (location, reward, augmented reality, you name it) to be accepted in businesses, the new features need to be an integrated part of the flow of people’s daily work routines. You can’t push “yet another tool” at employees every six months. Sure, on my phone I have icons for Facebook, FourSquare, Flickr, LinkedIn, Twitter, Wikipedia, etc, etc, etc – but at work, people expect to use a single (or maybe one or two) tool to get their work done. I don’t think I answered your question. 😉 Do I think location based services, along with check-in, reward and ranking are coming to the enterprise? Yes, but in limited scope. In your personal life, it is your choice to share this type of information. However, in several industries and countries it is illegal to track the activities of employees, especially when sharing that information. I used to run in to this often with new tools when I worked at IBM. Early adopters will always help drive the interest in new features, but the success of their enterprise adoption relies on vendors understanding the security, identity, and privacy requirements of business. I will also be keeping on eye on Plancast, Tungle, and TimeBridge which are rapidly growing Web 2.0 tools that bring a fresh approach to time management. It will be interesting to see if these types of tools and methods for socializing peoples’ calendars are being launched and adopted within enterprises in two years. Great post. We absolutely believe that game mechanics are making their way into the enterprise, and have customers that are already pushing forward on that path. I’d love to talk and hear more about what you’re doing at Spigit. Ping me at partners [at] bunchball.com if you’re interested.